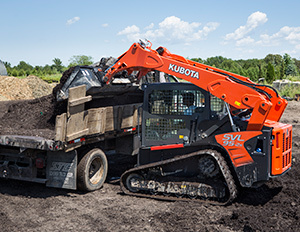 The newest addition to the Kubota compact track loader lineup is the SVL95-2s, which offers more power, improved multi-tasking capabilities and increased hydraulic horsepower that ups the ante in the compact track-loader segment. Powered by a Tier 4 Final turbocharged diesel engine, and equipped with a Common Rail System, the SVL95-2s delivers 96.4* gross horsepower and increased fuel economy. The new model also features cab upgrades for enhanced operator comfort, and outside, its five-way adjustable optional high flow hydraulics allows it to quickly match the hydraulic flow requirements of any hydraulic attachment.